Plans for a new mega Tesco in Hackney Central have been rejected by the Council. The supermarket giant’s proposed Aurora development, dubbed Tesco Towers, comprised a new hypermarket on the grocer’s Morning Lane site as well as residential tower blocks reaching a height of 13 storeys. Last month (28 July) the Town Hall’s planning sub-committee rejected the application, which Tesco claimed would create more jobs and help regenerate the area. Building conservationists had feared the development would damage views from the historic churchyard of St John at Hackney, which lies behind St Augustine’s Tower in a conservation area. Rev. Rob Wickham, the Rector of Hackney, had also expressed concern about the plans, saying the development would block light to the churchyard. 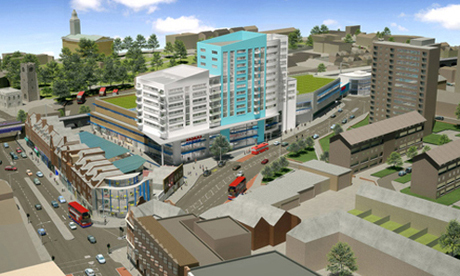 Tesco was intending to build the development in conjunction with Spenhill, its housing subsidiary. The company argued it should be applauded for bringing forward new development in a tough financial climate. The proposals, described by the council as a “major large-scale planning application”, would have involved the demolition of several buildings in Mare Street. As of spring 2009, supporting “opportunities for tall buildings” was an objective of the Council’s Hackney Central Action Plan.